FULTON, NY – The Marines Corps League presented several awards on Friday at the Fulton Mayor’s Office in order to thank community members for supporting the League’s mission over past year, giving back and servicing the community. In the back row from left are: Bonnie Hoyt, senior vice of the Women’s Auxiliary; Barry Ostrander, Parks and Recreation superintendent; Doug Clark and Jason Gallipeau, area manager of Dunkin Donuts. In the front row from left are: members of the Sea Cadets Amber Wilder and Amanda Wilder; Rick Buske, commandant of Marine Corps League; and Bud Shinnick Sr., vice commandant of Marines Corps League. 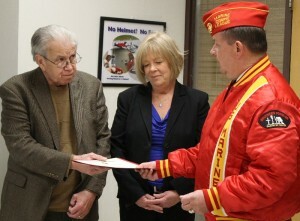 Also, Mayor Ron Woodward and his secretary, Cathy Trowbridge, were presented with awards for supporting and helping coordinate all Marine Corps League events over the past year. 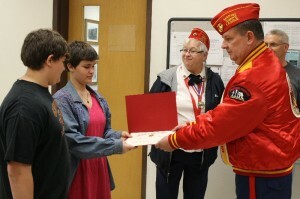 Amber and Amanda Wilder were recognized for volunteering at the Marine Corps League’s Easter event.